Blueberries are such a super fruit to bake with, not to mention the antioxidant and other healthful properties they posses. 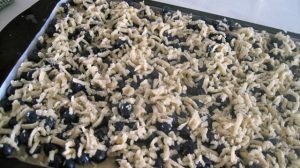 I have posted several blueberry cake recipes in the past, but there were so many people asking for this one, and since I aim to please, here it comes. 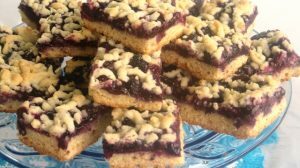 This cake is quite crunchy once freshly made, however in a day or two it begins to soften up from the blueberry juices flowing into it. I personally prefer it couple days later, rather than the same day as baked. This is how to spoon the dough onto the lined baking pan, and to spread it out evenly with the back of a wet spoon. Once the dough was spread, you prick it with a fork, before baking it. 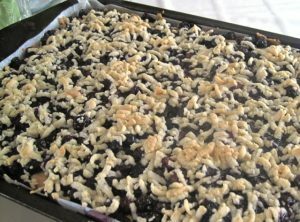 This picture shows you how to shred the crumbs dough onto the blueberry filling, and then the baked cake is cooling off. In a medium bowl combine dry ingredients: flour, baking powder, salt. 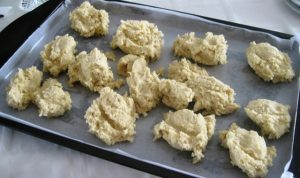 Cut in the butter, until crumbly mixture forms. In a large bowl mix together wet ingredients: whole eggs, egg yolks, sour cream, sugar, vanilla and orange extracts. Fold in dry ingredients into wet ingredients, until well combined, and soft dough is formed. 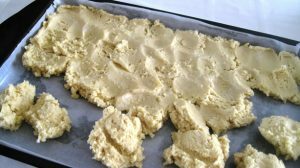 Place dough in the fridge for 30 minutes. Line a 13 x 18 baking sheet with parchment paper (dab the bottom of the pan with Crisco shortening to prevent the paper from sliding around). Grease the parchment paper, bottom and sides, with Crisco shortening. Drop spoonfuls of dough all around the bottom of the lined pan, then smooth it evenly by using the back of a spoon, repeatedly dipped in water to prevent sticking. 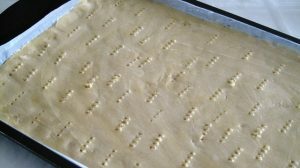 You can also place the dough on a floured waxed paper, cover it with another piece of waxed paper and roll it with a rolling pin to the size of the baking pan. Then transfer it onto the baking pan. Using a fork, prick the top of the cake dough, and bake 12 minutes in the preheated oven. While the cake is baking, prepare the crumb dough, and cool in the fridge. Remove cake from the oven, spread the prepared blueberries evenly over the hot cake. Top with the prepared crumbs, by shredding it on a large eye shredder, and bake for another 25 minutes, or until the crumbs turn golden color. Remove from the oven, and cool in the pan for 10 minutes. Grab the corners of the parchment paper and lift the cake from the pan onto a cooling rack to cool completely. This type of cake is much better couple days after it is baked. The moisture of the filling spreads into the bottom part of the cake, as well as the crumb topping. thank you sounds easy will try to prefect for our Christmas bazzar which is the biggest money making part of the bazzar. Our Ukrainian people sure like to eat the good food. Take Care and God bless. Ukrainians cook for 50…even if they only expect 10 for a dinner….LOL That is so cool!